Guy, Ken and the wall of Death. The telly is a mixed blessing, it brings a much larger world into our homes but does so through a prism of condescending gloss and distorts the evidence of circumstance by its own importance. On occasion though there emerge personalities that break through the skin of superficiality and show themselves to be genuine people in a way that may not always meet the expectations of the egos that generally infest the media world. One such event occurred this Easter when Guy Martin, a huge talent on the motorcycle racing scene, made an attempt at the world speed record on the wall of death, a record that didn’t really exist before but he set out to establish a benchmark by which others could be measured. I have never met Guy himself although he does appear regularly in the motorcycle press and has been cropping up more frequently on the TV of late. However, he had a team around him that had been brought together to ensure his attempt on the record was likely to be accomplished successfully and safely, for the Guinness Book of Records is now rather careful about what feats of human endeavour it associates itself with. Attention seekers parachuting into a paddling pool without a parachute are obviously not to be encouraged which is probably why we see all sorts of silliness like the number of toenail clippings crammed into a matchbox or suchlike instead. But anyway, one of those people helping Guy was a gentleman by the name of Ken Fox who runs three walls in total which he and his family take on tour throughout the UK and the continent and he is someone I have met and got to know a little, and like immensely, when he came to Tipperary over Easter 2015. Ken is a showman to his fingertips with a great deal to say and he says it with a conviction that broaches little argument, but when you are responsible for lads and lasses whirling round a wooden drum risking life and limb then the troupe needs a god like figure who’s word is law and is not to be countered lightly. Ken fills that role admirably and yet as he berates the general state of society or the lack of practical knowledge amongst today’s youth the realisation slowly grows that underneath it all lies one one of the most genuine fellows you are likely to meet who is fully in command of where he lies in this complex mix of business, entertainment, leadership and family commitments. His family, BTW, are very much part of the show and one of my endearing memories is of his wife cheerfully knitting away next to Ken, sagely nodding or shaking her head in tune with the dialogue, as he sat in his trailer expounding upon the frailties of humanity, yet don’t be fooled, she’s as alert to what needs to be done as any. The squad in fact is the epitome of a family team the like of which is often remarked upon but rarely encountered and their sons carry on the tradition, both being faultlessly polite and well spoken but each deeply aware of what is required and expected of them. Interestingly enough it was this softer side that came across on the box, Ken was a little out of his place in the studio setting although very much the patriarch when instructing Guy on his own wall, yet he was still his real self, not a five minute wonder glad of the lights and fawning crew as one suspected of the presenter, a character with such strength of personality that I hadn’t a clue who he was and even less interest in knowing! Another great unsung heroine of the affair was Sharon, Guy’s girlfriend, who was obviously new to the glitz and glamour and appeared unsure of quite how she should try to fit in, one can hardly blame her, but equally as obvious was the concern for her man to whom her attachment was so honest and certain that it left the media darlings floundering such is their assumption of superficiality in all. As a lesson in humanity and humility the programme should score top marks but there was also the main business of the day to consider and that was the setting of the record itself. 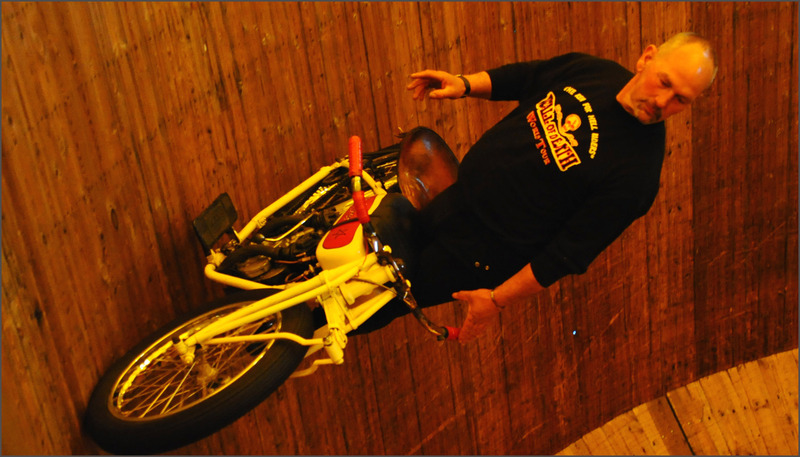 A full account of Ken Fox’s wall of death and their visit to Tipperary can be found in the April 16 edition of Irish Vintage Scene. EDIT: I’ve just noticed that Guy had always intended to use his own bike for the record and it is indeed based on a Triumph. This entry was posted in Uncategorized on March 29, 2016 by Triplemanr. For the want of a Million. 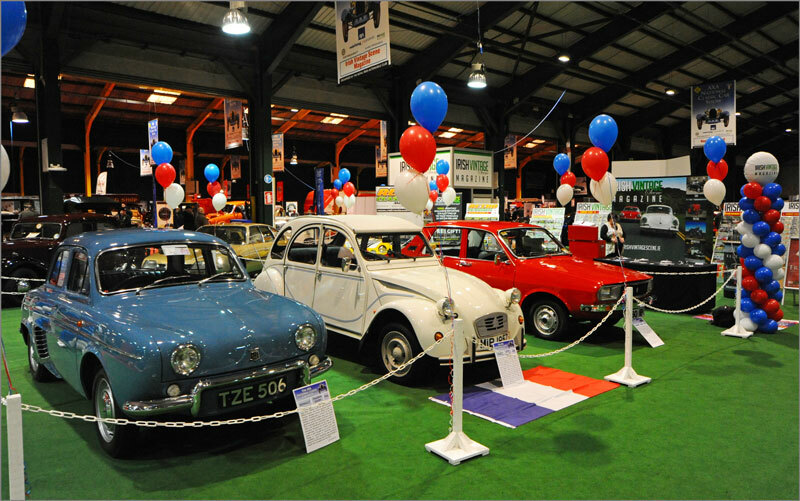 The theme of this years Axa Classic Car show was decidedly French. 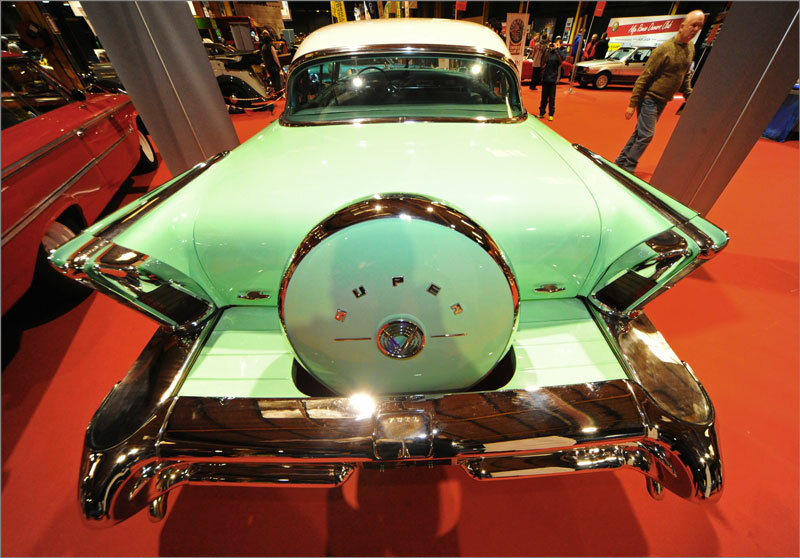 I was at the Dublin Classic Car show this weekend when a friend asked me what sort of cars I was in to? A good question, I struggled for an answer, but then it was perhaps not the question that I could answer, for it’s not the type of car that engages my attention but how they are designed, what is their form and how did they take motoring along to the next stage that I find so fascinating. To help me explain it might be worth looking at a few before coming to any conclusion about which I would most like to take home if I had that fantasy million. 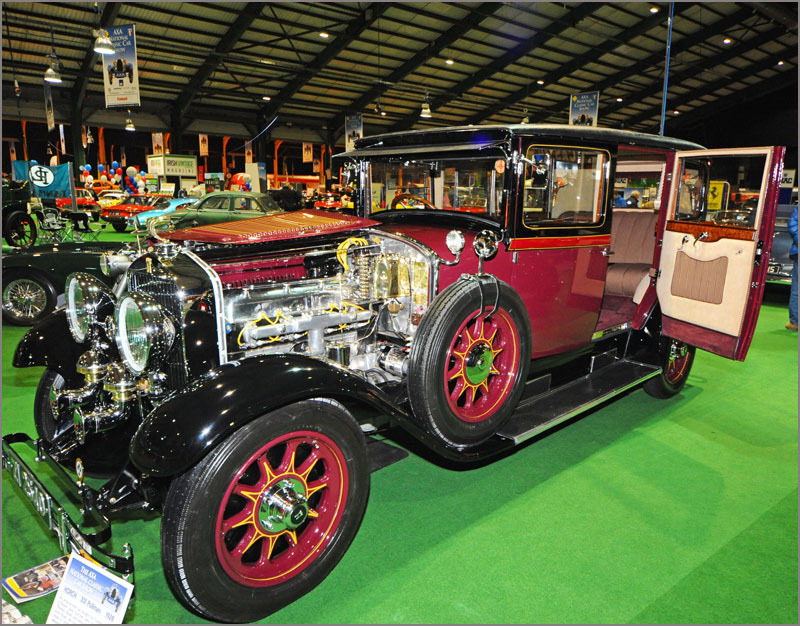 The 1920’s Horch, still at Home in Dublin. The first to be considered is a Horch from the mid Twenties. To say this car is magnificent is to do it an injustice, it is a drawing room for the gentry that happens to be mobile and takes every care to ensure that those in a certain position retain both their dignity and elegance. Naturally we expect such flattery to be served up by Rolls Royce yet they were not the only company to pamper the well to do and in this vehicle we see the finesse of German engineering coming to the fore. There is something whole and complete about this car, it is not a confection of chassis and body builder but constructed as one and therein lies it’s appeal. However, it is a car of its time and the conflict and tensions of the 20th century later saw its descendant company produce, of all things, the Trabant! To the staid and sober European there is really something quite horrendous about the monsters of chrome and bad taste that infested the roads of the US during the sixties. And indeed horrendous they are, but there is also something really quite wonderful about them as well. This was a dead end for car evolution and the reasons why it was so eagerly pursued tell us much about the confidence of the country back then. A cliche I know, but one that is no less worthy of our our attention when we consider these cars because of it. Half a century later we can step back and view these manifestations in all their grossness with an enlightenment that comes with the knowledge that perhaps we don’t actually own the world after all, but are the custodians for future generations. This Buick is worth preserving for that very reason, if no other. And now for something completely different, the humble Imp. Different in size and scope to the two already viewed maybe, but it was a remarkably innovative car. 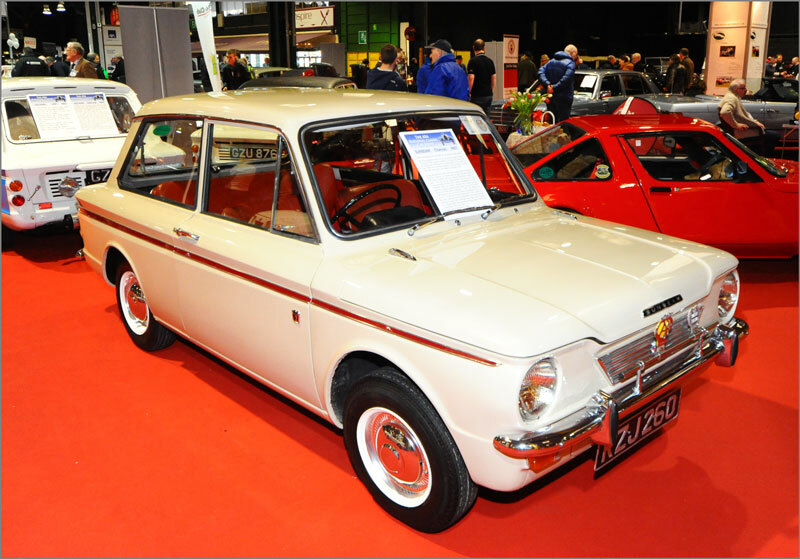 It had an all alloy engine, a first for a mass produced car, the engine was at the rear, another first for this type of vehicle and it employed a novel clutch that beat its BMC Mini rival hands down. They were super little cars, I was once an owner myself, and they still retain a following despite their head gaskets blowing every second Sunday and the build quality being somewhat indifferent at times. Made by ex shipbuilders in a run down area by the Clyde the manufacturing arrangements and costs never did justice to the design. Even so, 500,000 were produced and thankfully many are kept alive. It is a car of fond memories rather than modern day use so I would linger, but pass on to another should I ever need to choose just the one. So what would I be tempted to spend my million on? It needn’t be a million of course, something far more modest might suit, but the sum would remove the constraint of price to a large degree. 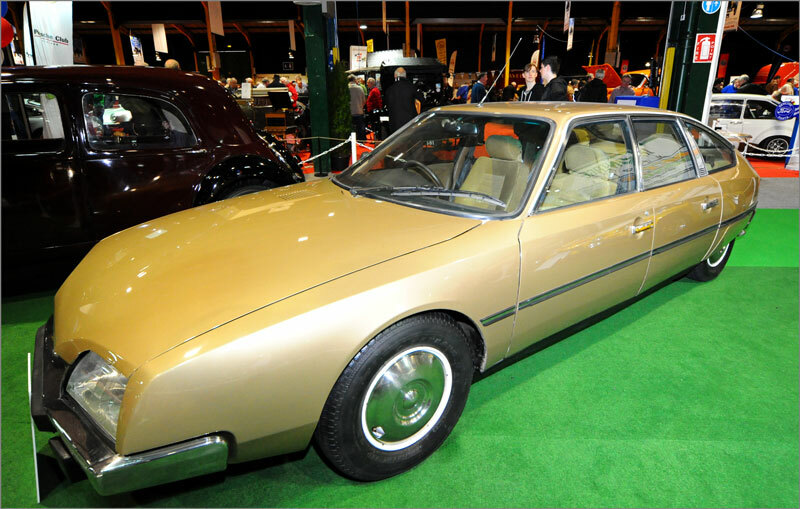 And so we come to what I think I would most prefer to have taken home, a car that I hardly took notice all day of but walking past from behind the purposeful urge of the body caught my eye, and by degrees I fell in love with the Citroen Athena CX. I know the company’s hydro pneumatic suspension to be quite brilliant, the controls advanced and the ride quality exquisite, but there was something besides, there is a determination about its style, whether the driver knows his route or not, the car is taking him there with a confidence and comfort that dismisses all other considerations. A tour of France would be an exercise in impunity, of certainty and aloofness that may well end in tears, but it would be such fun in the meanwhile! This entry was posted in Uncategorized on March 6, 2016 by Triplemanr.